We love what we do and take pride in every job, big or small, to make our customers happy. We live and breathe “Quality Service, Trusted Advice” and we are constantly looking at ways to further improve the experience for you in this rapidly changing world. We therefore really value the feedback we receive from you so please don’t hesitate to contact us to let us know about your experience. Whether it is purchasing or maintaining your car, it is all important to us. Don’t just listen to us though, see what our valued guests have to say..
“Today I collected my vehicle from your service department and wish to express my appreciation for the attention I received from Jason Davenport. My car is a 2000 model, not shiny or trendy but none the less an essential component of my life and activities. Nothing was too much trouble and Jason’s attitude of friendly and personable respect was most impressive. He explained all the findings of the service and the actions taken, along with potential future management recommendations very clearly. His familiarity with what he was discussing was unselfconsciously evident, without trace of condescension . Well done Jason, and a big thank you from a very happy customer! I hope I can treat my “customers” as well! “I am loving my new vehicle. Thank you. Also want to thank you for the photos. We really appreciate it. I will definitely refer you to family and friends who are considering buying a new car. Thank you again Rafael and to your awesome and enthusiastic team. The service I’ve received from Toyota Chadstone has been exceptional! “I recently had my Prado 40,000km service at Chadstone Toyota. I had a fantastic customer service experience from one of your service co-ordinators, Simone, and I wanted to make sure that management were aware of the service that was delivered by Simone, over and above my expectations. When I made my booking for the 40k service over the phone, I was put through to Simone who after arranging a suitable booking date, advised me that the vehicle would be required all day as it was a major service. On hearing this, I requested the use of a loan car, but Simone advised me that there were no loan vehicles available on that day, and in fact for the entire week. Without hesitation, and before I could suggest that I transfer my service to another time, Simone advised that as she lived close by me in Croydon, that she could swing past on the morning of my booking and pick my vehicle up and deliver it back on her way home that evening. Simone also advised that she would leave her Corolla for me to use during the day, should I need to go anywhere. Simone made several calls before the booking day to check that I would be ready for the early morning pick up, even calling me as she left home on the morning of pick up to warn me that she was on her way and calling me to advise that she was on her way that evening. My Prado was delivered back to me in the evening by Simone on her way home, as arranged. “I really appreciate the good service provided by Mr Rafael and other staff when we came to look for a car. Rafael explained to me all the features of various cars and even answered all my questions patiently. The people in the finance department were helpful as well. As a result, I am the proud owner of a Toyota Yaris today. I would like to continue my association with Chadstone Toyota in the future too. “I couldn’t be happier with the experience I had recently at Chadstone Toyota, buying my new 7 seater Kluger. 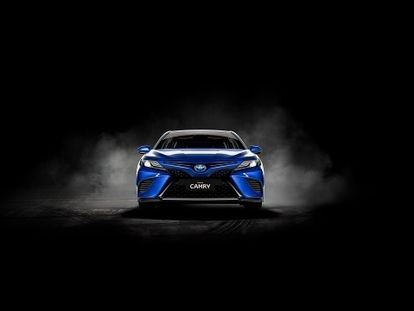 I’d shopped around other car brands, and another Toyota dealer, and chose Chadstone Toyota for their fantastic service and the competitive price they gave me on the car I ultimately decided to go with. I knew what I wanted and didn’t want the hard sell, or to be upsold. I wanted professional yet friendly service, from someone who actually listened to what I needed. I wanted someone who spoke to me normally, not in car industry speak, and that’s exactly what I got from the moment I walked in the door. The sales process was stress free, and I was kept up to date at all stages as the modifications I requested were made and I waited for the agreed delivery date. Hi Dean, I am writing to you to thank you personally for the very smooth dealings we had with you and your company. You quoted accurately and delivered as per the promise!!! A rarity in today’s world! Truly, you were great to deal with and I appreciate what you did for me and my company. We wouldn’t go anywhere else to buy a vehicle so you will be seeing us. Note, I thought if my Dad referred you, then you would have to be good!!! He is a fussy old bugger but he knows good service and value for money, so thanks again!!!! “Within the last month I purchased a Rav4 from your dealership. The salesman I purchased my vehicle from was Raffi Kevorkian. Prior to attending your dealership, I approached others, the first salesman told my partner within the first five minutes that they were an idiot, the second dealership we waited for 10 minutes whilst we watched all the salesman eat their lunch. We obviously left. My experience with Raffi has been very different, he is very personable, knows his products and was very helpful with all my questions and queries. If you would like to share your experience with us as well Contact us today, we always love to hear from you!